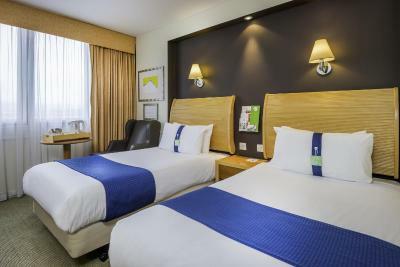 Lock in a great price for Holiday Inn - Glasgow Airport – rated 8.2 by recent guests! 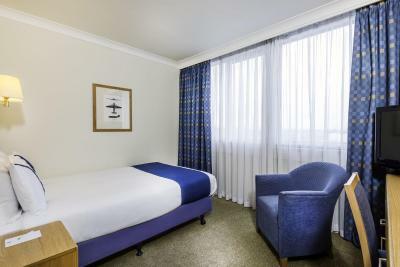 Literally right across the street from the Glasgow Airport departure terminal - 2 minutes from the hotel's front door. Perfect for us since we had a 6 am flight. Comfortable bed. Well appointed bathroom. Clean. Our Southampton to Glasgow fight (Flybe) was cancelled earlier in the day and we were forced to arrive in Glasgow after our connecting flight to Islay was gone. We were forced to stay overnight in Glasgow and did not want to be away from the airport. Holiday Inn was perfect for this unscheduled stay. 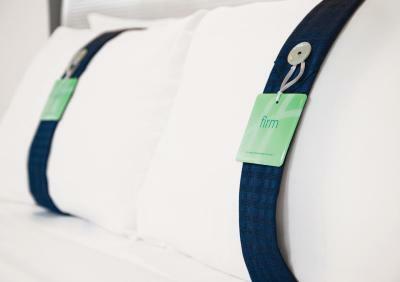 This is a perfect hotel to use if you have an early flight from the Airport. Surprisingly good food at the restaurant. Helpful check in staff. Great breakfast, comfortable room, walking distance from airport. Perfect for hitting the airport early in the am...it is literally a walk across the street! Restaurant was nice, staff friendly, room comfortable. Convenience to the airport. Always clean and well maintained. Welcoming staff. 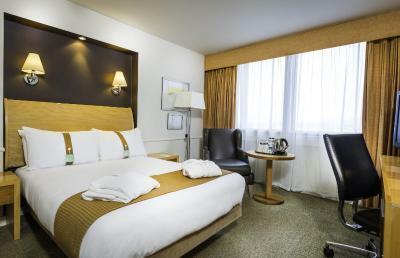 Holiday Inn - Glasgow Airport This rating is a reflection of how the property compares to the industry standard when it comes to price, facilities and services available. It's based on a self-evaluation by the property. Use this rating to help choose your stay! 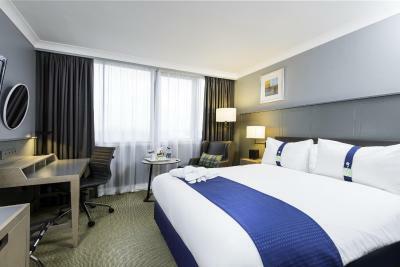 One of our top picks in Paisley.Less than 100 feet from Glasgow Airport, this Holiday Inn is just off of the M8 highway, providing easy access to central Glasgow. Rooms have private bathrooms and satellite TVs. Limited on-site parking is available. 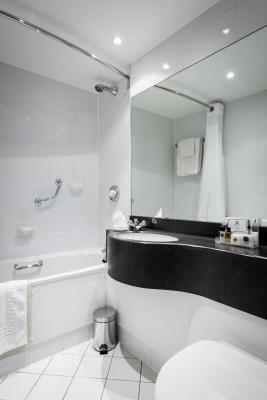 Air-conditioned rooms are double glazed for warmth and a peaceful night’s sleep. 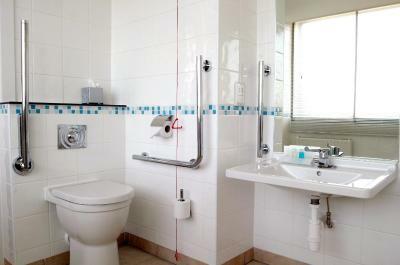 They feature bathtubs and showers, high-speed Wi-Fi, stereos and a morning newspaper. Continental and Scottish breakfasts are served from very early in the morning, and Traders Restaurant serves contemporary international cuisine. Hot and cold beverages can be enjoyed in Starbucks which is in the lounge area. Ibrox Stadium, the SECC and the Kings Theatre are all within easy reach as central Glasgow is just a 10-minute drive away. This property also has one of the top-rated locations in Paisley! Guests are happier about it compared to other properties in the area. 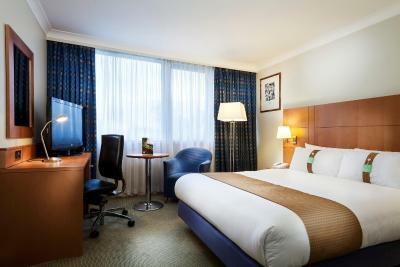 When would you like to stay at Holiday Inn - Glasgow Airport? This air-conditioned room features a flat-screen TV with Freeview channels, desk, private bathrooms and tea/coffee making facilities. 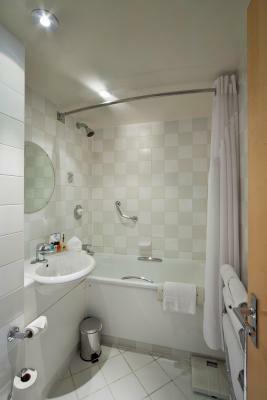 Executive rooms also come with the added comfort of bathrobes, slippers and a mini-bar. 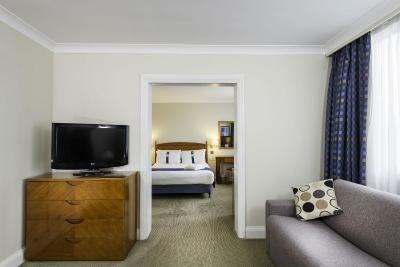 This accessible air-conditioned room features a flat-screen TV with Freeview channels, desk, private bathrooms and tea/coffee making facilities. 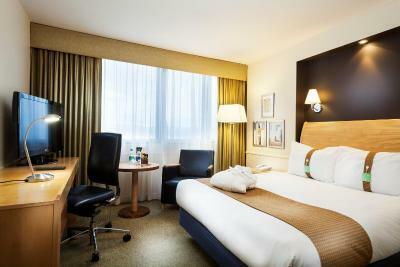 House Rules Holiday Inn - Glasgow Airport takes special requests – add in the next step! 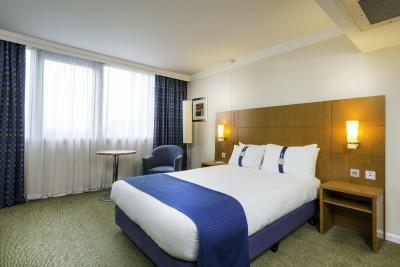 Holiday Inn - Glasgow Airport accepts these cards and reserves the right to temporarily hold an amount prior to arrival. The off site car parking provider is located at the following address: Sky Port​, Glasgow Airport, 1 Burnbrae Drive, Linwood, Paisley PA3 3BW. Everything, we were upgraded due to malfunctioning air conditioner. The staff in the bar were superb and extremely professional. 2 single beds. I am.sure that staff could have put them together to make a double as this is what we had requested. Location is excellent for airport. Closeness to airport and 24hr reception.. The proximity to the airport was excellent for an early morning flight. We had an excellent stay and enjoyed a lovely evening meal. A great start to our holiday! Room wasn’t clean, staff attitude where absolutely outrageous, asked for double room and girl replied if you don’t like it go elsewhere... worst hotel I’ve stayed at. Delay in booking in but it was fine with us. Signage at the airport to get to the hotel - it took us 3 loops through the maze of approach streets to find the right entrance to the hotel.